Hi, friends today I am going to tell you about free simple responsive blogger templates. Presently, it is found that everybody wants to create a blog and want to earn money online. It is true that earning money online without investment blogger is the best platform. You can earn a lot of money if you have the skill of blogging. In the past blogging was for those people who were very good in English; but now everybody can start blogging in his or her own native language i.e in Hindi, Bengali, Marathi, Gujarati, Tamil etc. Though the blog in English is a little bit good for ranking in Google with that of other languages. But don’t be disappointed. I saw many blogs in Hindi in India is highly successful. So, keep it up and I am sure you will be successful one day though I have not so much idea about blogging as I know that continuous work can make a man successful one day. What do you need to start blogging? To start blogging, first of all, you need a Gmail account which is absolutely free for everyone, a domain and a responsive mobile friendly template as now a day everybody is surfing the internet with the help of Smartphone or mobile. Here you will ask me what a domain is. Let me explain a little bit of domain. A domain is an address or nothing else. In reality, if you want to find someone with whom you have some important work you must need his or her address first likewise on the internet if you find something you need an address ( though with the help of Google you will find it easily) which is called domain. In a word, a domain is called an internet address. Keep in mind that I am talking about blogger.com, a free platform for creating a blog. To sign up here you need a Gmail account first so I am telling you to create a Gmail account first. If you don’t know how to create a Gmail account you will find many videos on YouTube. Search there and create it. You also need a template which the blogger.com gives you by default but it is not so good or user-friendly. So, you need a good template. You don’t need to purchase it. You can use it free of cost or if you want, you can buy it. Here given below I am describing some best 2018 SEO friendly templates. You can use it on your blog. Let me say one word by default blogger.com will provide a domain which is sub domain like xyz.blogspot.com. You must purchase a custom domain from Godaddy or Bigrock or from other domain sellers. A custom domain may help you in SEO or ranking. But to my mind, these two are the best though I am using .ooo domain which is now available free of cost. I have no option to buy a custom domain from GoDaddy or Bigrock. You can also try it. It is also a Top Level Domain. The visitors of this post may be some question about SEO (Search Engine Optimization). I will discuss it in the next post. So, visit my blog and I will discuss it later. All the five templates furnished below are of my own choice. If you do not like this as you can. But I recommend you to view one time and the decision is yours. If you are a photographer and want to publish a blog in blogger.com you may use Sora Front Blogger Template which is very fast loading. To download it Click Here. The theme is highly optimized for SEO. It is so responsive that every device it will look beautiful. Some of us may want to create a personal blog. If you want to do so you may use Eva Simple the blogger template. It looks beautiful, handy and responsive too. Though the template is created for female blogger only, it may be used in multipurpose too. To download and view this template Click Here. If you want to create a colorful blog for anything you can go for Spike Blog Blogger Template. The template is very beautiful, responsive, bright and colorful which will attract the visitor of your blog. To download it Click Here. 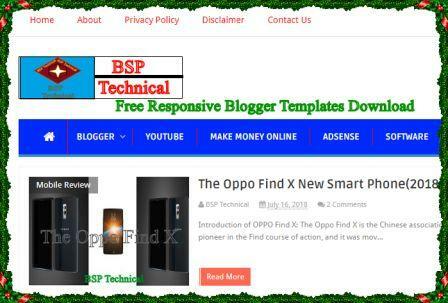 If you would like to make a Tech Blog you can use Newser Tech Blogger Template which is completely free of cost now as it is newly launched template. The template is highly optimized and responsive. You can customize it according to your own mind. To download the template Click Here. All the above-mentioned templates are very good for a blogger. Though there are lot more templates available in the market I personally prefer this kind of theme or template. You may search for many other according to your requirement. Always remember that if you want to earn some money your blog must be responsive, mobile friendly, SEO friendly, highly optimized and fast loading otherwise Google Ad Sense will not give you the approval to display adds from their end. If you want to know more about it you may comment below. I always want to respond, my visitors. So, feel free to ask me your need and I will try my best to solve it by publishing a post or replying to you in the comment section.